I used to carry semi-auto’s extensively, and revolvers only for use as BUG’s, but this has changed in recent years. Firstly, in training disabled or handicapped shooters, I’ve noticed that many of them simply can’t handle a pistol properly. Their limited upper body and/or arm strength makes “limp-wristing” a fact of life. Now, in a combat situation, one is very likely indeed to be shooting from the ground, having been knocked down; or with one hand, using the other to fend off an attacker at close range; or after being shot or stabbed oneself, and having to shoot with that impairment. Given these circumstances, the chances of “limp-wristing” a pistol are very real. It’s a problem that simply doesn’t arise with a revolver. Secondly, pistols are notoriously ammo-sensitive. There are some (e.g. Glock, SIG, etc.) that feed almost anything with monotonous reliability: but others (including the fabled 1911) need a certain type of bullet to feed reliably. All of them need a certain amount of power to cycle reliably. All of them, to a greater or lesser extent, rely on lubrication and a lack of dirt in the action to work properly. A revolver is less susceptible to these problems: it will feed anything, anytime; it will fire irrespective of the power level of the bullet; and it will shoot at least a few rounds even if bone dry and covered with dust and dirt. Third, simplicity of action is of major importance. One’s fine motor skills tend to degrade significantly in a high-stress environment. One needs no fine motor skills at all to fire a revolver, but several of them to use the average pistol, what with safeties, slide stops, etc. Also, in certain situations (e.g. with the muzzle pushed into the torso of one’s attacker, or the gun grasped by one’s assailant) a pistol slide can be pushed “out of battery”, meaning that the gun will not fire and/or will not cycle the action if fired. A revolver suffers rather less from this handicap (although if the cylinder is grasped, it can be prevented from turning, so a revolver isn’t altogether immune). 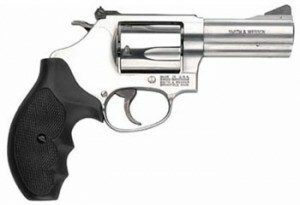 Fourthly, a well-tuned and well-set-up revolver will rival most autopistols in accuracy and ease of use. A good action job makes the double-action trigger pull a joy to use. A moonclip conversion means that speed of reloading is almost identical to most autopistols, and a speedloader is not too far behind. A decent set of sights are OK, but the fixed sights on something like a S&W Model 13 or 65 are just fine for most combat distances (I can get a decent group with them at up to 50 yards), and they won’t get knocked out of alignment by being dropped.